One of the points I’ve made a number of times on my blog is that life isn’t fair and that God doesn’t owe us anything. That means that he doesn’t owe us a spouse… and he doesn’t owe us any children. This particular Psalm is a powerful reminder that children are a gift from God. Given this, I have trouble understanding why so many Christians seem so eager to keep their families small. Financial hardships and worrying about having enough food on the table is one thing, but most of those I see adopt this attitude are not destitute. More than a few are quite well off. They could easily support more. For myself, I don’t understand how they can reject such a gift as that from God. I think of all those who want children, or more of them, but cannot have them, and I imagine that they must be even more frustrated than I. And I suspect that God is the most frustrated of all, for in rejecting His gift they also reject him. With all of this in mind, I would ask my readers to pray for those husbands and wives who do want children, or more of them, but cannot. May God grant them that special blessing and the joy of being a parent. 17 Let the elders who rule well be considered worthy of double honor, especially those who labor in preaching and teaching; 18 for the scripture says, “You shall not muzzle an ox when it is treading out the grain,” and, “The laborer deserves his wages.” 19 Never admit any charge against an elder except on the evidence of two or three witnesses. 20 As for those who persist in sin, rebuke them in the presence of all, so that the rest may stand in fear. 21 In the presence of God and of Christ Jesus and of the elect angels I charge you to keep these rules without favor, doing nothing from partiality. 22 Do not be hasty in the laying on of hands, nor participate in another man’s sins; keep yourself pure. Two things interest me about this passage today. The first is that we should be generous to our elders- our priests. They do the Lord’s work, and this should be recognized and compensated by us. While they should always be in our prayers, let us also take the time to find ways to reward them for their labor. Whether it is in time, coin or something else, they deserve it. The second bit that caught my attention is the public rebuke of sin. The scandals in the Catholic Church are an unfortunate example of what happens when we ignore scripture. While the Church should never be quick to punish a priest without verifying wrongdoing, such wrongdoing should never be covered up. Those who betray their sacred charge as inheritors of the Apostolic Tradition must be called out and exposed. It must be made clear to all that such actions can never be tolerated. We can see in the present day the terrible cost that comes when this sage instruction is ignored. It is not unheard of for some manospherian commenters to make the argument that Jesus never condemned fornication by men. They dismiss any criticism of their immoral lives by saying that it was the machinations of Jesus’s disciples which lead the Church to condemn sexual immorality by men other than adultery. This is of course utter rubbish, on many levels. The most obvious is the fact that the apostles and disciples of Jesus, whom they condemn, are the ones who brought us the words of Jesus in the first place. But an even greater retort is this passage above, as well as its counterpart in the Gospel of Matthew. Jesus clearly condemns several different sexually immoral practices here, including fornication, adultery and licentiousness. PUAs pretty obviously practice the first and the last of those, and therefore have no leg to stand upon. The passage above makes for an easy counter to their arguments, and so I keep it around whenever dealing with those sorts. I don’t expect them to change their behavior, but for those wavering who are reading them, it might make a difference in helping them stay on the narrow path. Kassia (Greek: Κασσιανή Kassiani; 805/810 – before 865) was a Byzantine abbess, poet, composer, and hymnographer. She is one of the first medieval composers whose scores are both extant and able to be interpreted by modern scholars and musicians. 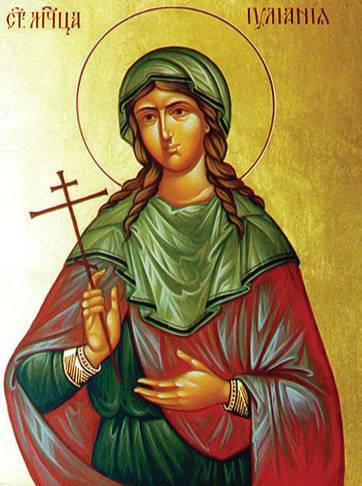 Approximately fifty of her hymns are extant and twenty-three are included in Orthodox Church liturgical books. The exact number is difficult to assess, as many hymns are ascribed to different authors in different manuscripts and are often identified as anonymous. Kassia is notable as one of only two Byzantine women known to have written in their own names during the Middle Ages, other being Anna Comnena. The series continues with St. Cyril of Jerusalem’s Catechetical Letters. This post features the second part of his fourth letter. 20. The soul is immortal, and all souls are alike both of men and women; for only the members of the body are distinguished. There is not a class of souls sinning by nature, and a class of souls practicing righteousness by nature : but both act from choice, the substance of their souls being of one kind only, and alike in all. I know, however, that I am talking much, and that the time is already long: but what is more precious than salvation? Are you not willing to take trouble in getting provisions for the way against the heretics? And will you not learn the bye-paths of the road, lest from ignorance thou fall down a precipice? If your teachers think it no small gain for you to learn these things, should not thou the learner gladly receive the multitude of things told you? 24. And to the doctrine of chastity let the first to give heed be the order of Solitaries and of Virgins, who maintain the angelic life in the world; and let the rest of the Church’s people follow them. For you, brethren, a great crown is laid up: barter not away a great dignity for a petty pleasure: listen to the Apostle speaking: Lest there be any fornicator or profane person, as Esau, who for one mess of meat sold his own birthright. Hebrews 12:16 Enrolled henceforth in the Angelic books for your profession of chastity, see that thou be not blotted out again for your practice of fornication. 25. Nor again, on the other hand, in maintaining your chastity be thou puffed up against those who walk in the humbler path of matrimony. For as the Apostle says, Let marriage be had in honour among all, and let the bed be undefiled. Hebrews 13:4 Thou too who retainest your chastity, were you not begotten of those who had married? Because you have a possession of gold, do not on that account reprobate the silver. But let those also be of good cheer, who being married use marriage lawfully; who make a marriage according to God’s ordinance, and not of wantonness for the sake of unbounded license; who recognise seasons of abstinence, that they may give themselves unto prayer 1 Corinthians 7:5; who in our assemblies bring clean bodies as well as clean garments into the Church; who have entered upon matrimony for the procreation of children, but not for indulgence. 27. And concerning food let these be your ordinances, since in regard to meats also many stumble. For some deal indifferently with things offered to idols , while others discipline themselves, but condemn those that eat: and in different ways men’s souls are defiled in the matter of meats, from ignorance of the useful reasons for eating and not eating. For we fast by abstaining from wine and flesh, not because we abhor them as abominations, but because we look for our reward; that having scorned things sensible, we may enjoy a spiritual and intellectual feast; and that having now sown in tears we may reap in joy in the world to come. Despise not therefore them that eat, and because of the weakness of their bodies partake of food: nor yet blame these who use a little wine for their stomach’s sake and their often infirmities 1 Timothy 5:23: and neither condemn the men as sinners, nor abhor the flesh as strange food; for the Apostle knows some of this sort, when he says: forbidding to marry, and commanding to abstain from meats, which God created to be received with thanksgiving by them that believe. 1 Timothy 4:3 In abstaining then from these things, abstain not as from things abominable , else you have no reward: but as being good things disregard them for the sake of the better spiritual things set before you. 30. Be tender, I beseech you, of this body, and understand that you will be raised from the dead, to be judged with this body. But if there steal into your mind any thought of unbelief, as though the thing were impossible, judge of the things unseen by what happens to yourself. For tell me; a hundred years ago or more, think where wast you yourself: and from what a most minute and mean substance you have come to so great a stature, and so much dignity of beauty. What then? Cannot He who brought the non-existent into being, raise up again that which already exists and has decayed ? He who raises the grain, which is sown for our sakes, as year by year it dies—will He have difficulty in raising us up, for whose sakes that grain also has been raised ? Do you see how the trees stand now for many months without either fruit or leaves: but when the winter is past they spring up whole into life again as if from the dead : shall not we much rather and more easily return to life? The rod of Moses was transformed by the will of God into the unfamiliar nature of a serpent: and cannot a man, who has fallen into death, be restored to himself again? 32. For this cause the Lord, preventing us according to His loving-kindness, has granted repentance at Baptism , in order that we may cast off the chief— nay rather the whole burden of our sins, and having received the seal by the Holy Ghost, may be made heirs of eternal life. But as we have spoken sufficiently concerning the Laver the day before yesterday, let us now return to the remaining subjects of our introductory teaching. 33. Now these the divinely-inspired Scriptures of both the Old and the New Testament teach us. For the God of the two Testaments is One, Who in the Old Testament foretold the Christ Who appeared in the New; Who by the Law and the Prophets led us to Christ’s school. For before faith came, we were kept in ward under the law, and, the law has been our tutor to bring us unto Christ. And if ever thou hear any of the heretics speaking evil of the Law or the Prophets, answer in the sound of the Saviour’s voice, saying, Jesus came not to destroy the Law, but to fulfill it. Matthew 5:17 Learn also diligently, and from the Church, what are the books of the Old Testament, and what those of the New. And, pray, read none of the apocryphal writings : for why do you, who know not those which are acknowledged among all, trouble yourself in vain about those which are disputed? Read the Divine Scriptures, the twenty-two books of the Old Testament, these that have been translated by the Seventy-two Interpreters. it’s an endless competition to see who can outdo the other in terms of getting their genetic/sexual imperative vindicated. While I agree that there is certainly competition here, I think that it is mostly an argument over semantics, as both war and competition are forms of struggle. And what we are seeing is certainly a struggle. Moreover, it is not just a struggle between men and women but also among men and among women. Men compete with one another for the best women, and women compete with one another for the best men. Novaseeker’s comment, which I linked earlier, really goes into depth on this and I suggest that everyone read it for a thorough explanation of this. In a way this struggle is the “war of all against all” that Hobbes warned about centuries ago. Yes, this is a war, but look at the effort expended to make sure that neither side will be interested in a truce. How many women are miserably working a terrible job when they want to be a mother? How many men are numbing the pain with drink, women, or games because they are not going to take the risk of ending up an ex husband? The enemy has to scream and threaten to get both sides to reluctantly oppose one another. Conflict is inevitable, but so is equilibrium. TSK is correct that the present state of the conflict is the result of a concentrated effort to exacerbate the situation. However, removing that ‘incitement’ does not meat that both sides will be interested in a truce. If the incitement was removed, the conflict would still exist. That is the central premise of the first post. It might be more of a subtle conflict, with most of the “fighting” less visible, but the conflict will persist. Another thing to consider is that the incitement is a natural outgrowth of the conflict itself. Rather than being the cause, it is an effect. Our own preferences might drive some individuals to “stir up the pot” in order to benefit their own part of this struggle. Given that men give up polygamy and women give up serial monogamy, I would think (traditional) marriage would fall into this category. What am I missing? Stingray didn’t miss anything. Traditional marriage (not the modern day “traditional marriage” variety either) was a compromise, a truce of sorts. The thing is, neither side wants a compromise. Men and women want a system which supports their preferred sexual strategy. Equilibrium, at least, a static form of it, is not something that can last. In fact, it was TSK who pointed out that the destruction of Traditional Marrage “was a joint effort, because they both thought that they could get an advantage.” Both men and women will always want to push the boundaries. Something more likely than a truce is a withdrawal or retreat of sorts. What I mean is that members of one “side” decide to stop fighting and just remove themselves from the conflict as much as they can. The MGTOW movement is an example of this in action. Rather than compete, they merely try and survive. Of course, they cannot fully escape, thanks to taxes and such. But in so far as they can, they try to not get involved in the conflict. This is something I think will become more prominent in the future, at least among men. It is also possible we might see women start to do this as well- they are likely to be affected by a drop in male desirability just as men have been affected by a drop in female desirability. These “base strategies” that are “hard-wired” have been revealed from the beginning as fundamentally untrue. They only feel true because the hard-wiring has been shot through with 1.21 gigawatts of sin. The receptors are fried, man. Cane is correct that what I referred to as “base” or “natural” impulses of men and women are something Christians should understand to be the product of the Fall. I put “lose” in quotes in my first post because I wanted to indicate that what we think is a loss might not necessarily be so. After all, what we want is not necessarily what is good for us. Usually it isn’t. Sin blinds us, and directs our hearts (and other organs) in the wrong direction more often than not. Once we understand this, we can finally see how victory is possible. You see, “victory” in the “war between the sexes” can come about only when we realize that this war is one which was stirred up by the Evil One. It is a war whose origins date back to the Fall, when the serpent pit man and woman against one another, and against God, for the first time (this was the first instance of someone playing “lets you and him fight”). This war can be won by recognizing that it is a war we shouldn’t be fighting in the first place. “The only winning move is not to play.” Instead of men and women fighting one another, they we, need to cooperate and fight against sin, which is the real enemy deserving of our attention. This, I think, is where the real break between the secular and Christian “Red Pill” community is to be found. The secular PR community aims to equip men with the tools they need so they can get the best possible deal for themselves. In other words, to arm them with the best weapons possible to wage war against women, so they can score as many big victories as possible (however each individual man chooses to define victory). However, that strategy cannot bring the war to the end. It only seeks to give men the best odds possible and make them the temporary “winners.” The Christian RP community should recognize that this is not a winning strategy. Men who pursue this course are still puppets being controlled by the ruler of this world. Their “victories” are illusory. Keeping in line with the “red pill”, they are still in the Matrix, as they are still slaves to their sin- they only think that they have escaped. When I spoke of the natural in my first post, it was because I wanted to emphasize the necessity of the supernatural to overcome our base or worldly nature. By ourselves we cannot hope to overcome our sinfulness. It is only through God’s Grace that we can achieve this. God has also provided us with the template of how a lasting “truce” between the sexes can be arranged, through the sacrament of marriage. There is no need to invent something new to get out us of the trench we find ourselves in. We have the tools, in fact we were given them a long time ago. We only need to remember that we have them, and to use them again as they were meant to be used. This will require that we set aside the notion that we know better than God. It will require humility, and patience, and lots of prayer. However, there is no other way. And it is certainly better than the alternative- an endless war that cannot be won. Am I supposed to take comfort in the fact that it is not revenge [driving this situation], but rather WAR? Reading through this, I was reminded of Dalrock’s point that Feminists are miserly with love. I don’t think this is limited to Feminists, however. I think we all must fight the tendency to be miserly with love. For myself, I know that I know that charity doesn’t come easily most of the time. There are some things I can be generous with, but at other times I struggle to give of myself. It is very easy to lose sight of the fact that everything we give up in charity in this life is repaid in the next. I need to constantly remind myself of this, and I realize that it is something I need God’s help in, because I haven’t the strength myself. Two things of note caught my attention while praying this Psalm recently. The first is found in verses 3 and 4. Trust is a delicate thing. One thing that has helped me in my faith is that I’ve always known I can trust God. He has always kept His faith with me, and I’ve never felt a sense of betrayal. All of the bad theology and false guidance I’ve received over the years I know to be the work of humans, not of God. I think this is an important thing for those of us to keep in mind who have been fed false theology for so long. We should know that in God alone can we trust, and that if anything, we should have expected to be let down (one way or another) by our fellow man. Verses 7-9 also caught my attention, because they seem to describe Jesus to a T. Fed the hungry? Check. Set prisoners free? Check (think of those imprisoned in Sheol before His death). Opened the eyes of the blind? Check. And so on and so forth. There are lots of little hints like this scattered throughout Scripture, and its quite fun to come across them when you aren’t expecting it. At least, so it seems to me. My NAB translations says, instead of the man being happy, that the newlywed man would “bring joy to his wife” by staying there. I’m curious if any of my readers who are better in translations than I have any thoughts on which is the better translation. I’ve a few thoughts on this, and the translation matters. This is an interesting saying by Jesus, and one that has never been easy for me to understand. I’m curious what interpretations exist for it, and when I get a chance I will see what some of the saints have said. After re-reading it, I think that what Jesus is saying is that the way we look at the world (the health of our eye) affects everything we do. A cynical outlook that distorts the nature of God’s Creation will reverberate throughout out body, and affect everything about us. In essence, our body and our actions will come to match our dark outlook on life. Perhaps some of my readers can offer their thoughts.